google-site-verification: google8d8438b214143f71.html Beautiful Quotes: Ever Wondered Why Numbers on Phones and Calculators are Reversed? Ever Wondered Why Numbers on Phones and Calculators are Reversed? Have you ever noticed that the keypads for calculators and phones are different? 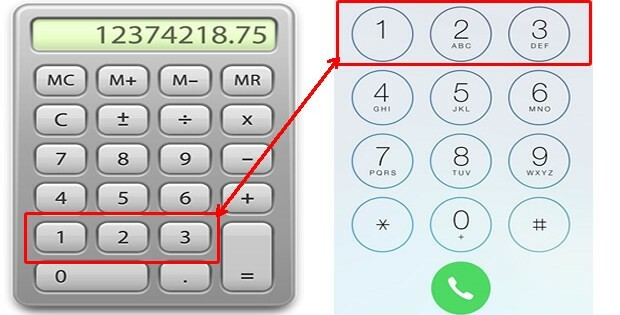 Though both keypads have zero at the bottom, the remaining numbers go from bottom to top on the calculator, and top to bottom on the phone. Why is that? Read on to know. The story begins back in pre-calculator days, when there were mechanical cash registers. These cash registers were designed with 0 at the bottom, and the numbers going up. While making numerous calculations, 0 is the number which is used the most. So it made practical sense to place it below all other numbers so that it is the most accessible. When mechanical calculators made their appearance, they used the same format as cash register with 0 at the bottom and 9 on top. When hand-held and electronic calculators made their appearance, they implemented the keypad arrangement of the existing calculators–0 at the bottom, 1-2-3 in the next row, 4-5-6 in the next row, and 7-8-9 in the top row, from left to right. So, basically, they evolved from the cash register. But now comes the big question. WHEN TELECOM COMPANIES DEVELOPED PHONES, WHY DIDN’T THEY SIMPLY REPLICATE THE CALCULATOR KEYPAD LAYOUT? Before the touch-tone phone, of course, rotary dials were the rule. The rotary telephone was invention in the early 1900s. Instead of buttons, the numbers on the telephone were holes from 1-9, and then 0. The idea was to stick your finger in the hole and spin it around to dial each number. Since it was an all-new design, engineers in the Bell team could not come to a consensus on what the keypad layout should be. While some engineers were of the opinion that it should be a 5×2 matrix (5 rows, 2 columns), some thought 3×3 matrix would be fine, while few others thought just replicating the calculator layout would be good enough. To resolve this, the engineering team conducted an experiments with several kinds of keypad layouts and invited hundreds of people to use them & provide their feedback. The engineers at Bell Labs discovered people were more comfortable with a keypad layout which had 1-2-3 on top. The experiment results were published in their tech journal, an excerpt of which is as follows. With these experiment results, Bell engineers were not confused anymore, and quickly implemented the design which people preferred, thereby resulting in the keypad layout which is still in use today and has been adapted to cellphones as well, but with a contrasting difference over calculator keypad layout.